President Lyndon B. Johnson tries to motivate peace by responding to ‘the looting and the burning’ occuring during the D.C. riots that took place in 1968 after the assasination of Martin Luther King Jr. 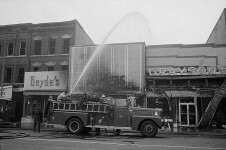 Images, explanations and accounts are offered from witnesses of the Washington, D.C. riots after a major civil rights leader, Martin Luther King, Jr., was taken from the community. 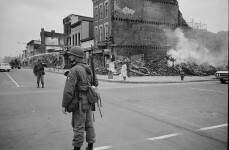 Store owners and witnesses who watched the D.C. riots unfold explain the chaos when people were looting the stores as well as what it was like for the troops to come in and take over the city.